See more objects with the tag birds, metalwork. See more objects with the color thistle darkgrey darkslategrey darkblue darkslategrey or see all the colors for this object. This is a Birdcage. It is dated 19th century and we acquired it in 1916. 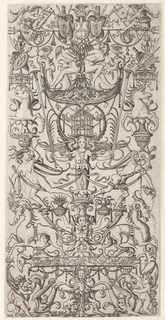 Its medium is glass, silver-plated metal, metal, gilt wood. It is a part of the Product Design and Decorative Arts department. When the Hewitt sisters travelled to Europe in pursuit of objects for the museum they were creating (see photo of Sarah, Eleanor, and Amy Hewitt in a Venetian gondola), they collected items that, today, might not seem immediately relevant to a design museum—like birdcages. 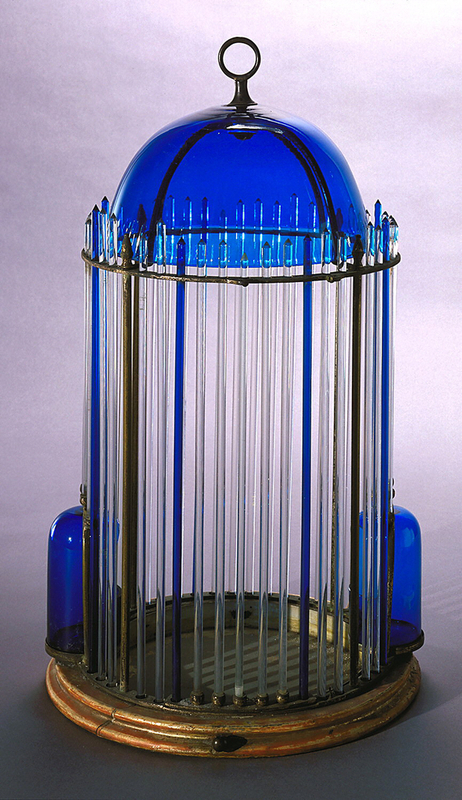 The European-focused Hewitt sisters acquired birdcages in various media, such as ceramics and glass. Others represent specific architecture from various locations.